Polar vortex, polar invasion or just plain winter. No matter what you call it, it’s HERE already and I am beginning to hear and see what this cold weather does to people. Living in the north I hear the best excuses on why people can’t come to exercise classes- ” it’s dark outside when I get home”, “it’s snowing “, ” I just feel sleepy in the winter “. Crazy or arctic hysteria I don’t know, but when we give in to those thoughts we sabotage our continued fitness efforts and this can lead to what I see and have now started calling-POLAR POSTURE. 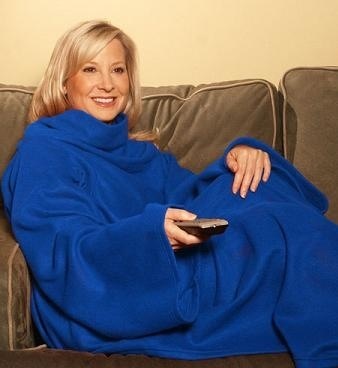 Here’s what it looks like- forward head, rounded shoulders, flexed low back, tight hip flexors- basically the couch sitting, Snuggie wearing, cocoa drinking posture we assume to hunker down and hibernate in front of our TVs for 5 months. Ughhhh. From lack of sunshine, prolonged sitting, to changes in eating habits all of these winter behaviors can really take their toll physically. Musculoskeletal imbalances from posture changes result in back, shoulder and neck pain, and can be impacted by our postural hibernation habits. These imbalances can increase our risk for injuries. So let’s talk about why. First off, with the days being shorter and weather worse we spend too much time indoors mostly sitting. Our bodies are designed to stand not sit, and the more we sit, the worse our posture gets, as our spine rounds forward, neck protrudes forward and shoulders round forward. These postures result in increased upper neck tension, stiffness in joints, increased risk of disc protrusions, referred pain like sciatica, shoulder impingement and even more shallow breathing due to the forward posture restricting rib movement. The cold temperatures do not help. When we are cold, the body’s response is to curl up to conserve heat. What do we do again? Round our shoulders, round our upper back, flex forward and breathe more shallowly. Sound familiar? Again the same posture as sitting on the couch. Abdominal core strength is also impacted by this winter postural position. When the core is not used to support the spine in a neutral posture it becomes weak. It weakens from the inside out. So the deep postural muscles are no longer supporting the bony structure as needed to provide stable movement. In the winter we eat differently too. Summer salads and fresh foods are replaced with warm cozy comfort foods. We are less active. This combo leads to weight gain and reduced muscle tone. Our muscles lose some of their elasticity from the disuse, making it harder to cope with the above mentioned postural imbalances. This then makes us more prone to strains and injury when we finally do roll off the couch and out from under our fur throw. So what do you do? Be aware of all these issues first. Know that you have complete control and the power to make the right choices. Keep up with your regular fitness schedule. Don’t make excuses because of the weather. You cannot control the weather but you can control your fitness routine. If you cannot get out of the house because you are snowed in there are many quick exercises you can do to keep that posture in check. Here are a few exercises that only require a chair and a foam roller. If you don’t have a roller, you can get one at http://www.optp.com. I like the black axis foam rollers best. 2. Chest Stretches– Open up your rib cage and shoulders by laying on your foam roller vertically with your arms open to a 90 degree angle. Breathe into the pectoralis muscles and feel the chest stretch. Allow the muscles to relax and lengthen. Repeat breathing at your own pace for 3-5 minutes. 3. Chin nods– While laying on your foam roller, inhale and tuck your chin towards your chest as if squeezing a small ball between your chin and chest, exhale and let the chin resume it’s normal posture. Repeat this 10 times. 4. Upper Back Stretch– Place your foam roller horizontally in your upper back. Place your hands behind your head with your knees bent and hang backwards over the roller stretching your upper back and reversing the thoracic curve. Hold for a few breaths, then lift your pelvis and roll on the upper back muscles to relieve any tension. 5. Hip flexor stretch– Stand up, hold onto a stable surface, reach back and grab your ankle while bending your knee and pull your leg back. Hold for 15 seconds to stretch the front of you hip and thigh. If you just have to lay down at this point 🙂 you can do this while laying on your side. These exercises can be done daily to help keep you out of the “Polar Posture”. Remember to keep up with your regular classes for flexibility , strength and cardio too and you should make it out of the Arctic weather season unscathed. If you would like more foam roller stretches. My e-book-” On a Roll@Home, Stretch and Massage” has all the exercises you need to get you through that long winters night. Visit my website store page to view retailers. Need more ? Classes and private training is available , just be warned. You must leave your house during the winter to attend!! Since we are doing the 8- week Hamstring Challenge in my classes this fall I thought I would write a bit about why those tight hamstrings are a problem. They are really relatively easy to stretch and easy to measure the range of motion, so there really is no excuse for not taking the time to do the stretching exercises. And you will feel the results happening quicker than you think. Stretching only once is a while can stretch them but the results will only be short lived. The stretches must be done over a period of time to see the long term results. After that then a maintenance program can be done. You can liken stretching the hamstrings to stretching a rubber band. The rubber band will eventually bounce back to its original length unless stretched again. In that way there is a carry over from one stretch to the next. A study by J. Yimen et al, found that after a 4- week stretching program at home, straight leg raise angle increased by 25%. participants in his study were men in their 20’s who stretched their hamstrings in standing for 30 secs, 6 reps, once a day. You will be doing an 8 week program and performing the exercises twice a day ! Imbalanced quadriceps are most often the cause of tight hamstrings. Your quads are a large, strong group of anterior muscles located on the front of your thigh just above your knee. When your quadriceps are stronger than your hamstrings, it creates tension because your hamstrings are weaker. When your hamstrings (or any muscle for that matter) is weak or fatigued, you are more susceptible to injury. In sports such as soccer or running (particularly sprinting events), your hamstring muscles work overtime to help you extend your legs to run fast or jump. It is somewhere during the point where our foot or leg is fully extended, that we are most susceptible to a hamstring injury or strain. Runners, cyclists, rowers and soccer players are all at higher risks of developing “tight” hamstrings as all of these activities require quite a bit of strong knee flexion. However, other causes of tightness can also be the result of sitting for long periods of time (Hello, desk job and long road trips!). HOW DO YOU KNOW IF YOUR HAMSTRINGS ARE TIGHT? You often don’t realize you have tight hamstrings until they start affecting movement or start creating back or knee pain. Tight hamstrings affect the position of the pelvis which can directly affect the posture of the spine and this can cause mechanical low back pain. Poor low back posture could also be a sign that your hamstrings are tight. You will see a flattened lumbar spinal curve if your hamstrings are tight. You also may notice that you have hamstring tightness if you are doing programs like Pilates or Yoga. Tight hamstrings interfere with normal flow of movement and your ability to get into the correct position to execute your moves. 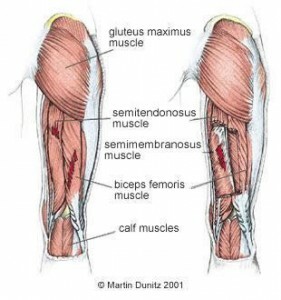 A quick note – is that your hamstrings are not all “equally”tight. Meaning your right and left hamstrings may be different lengths. This can cause problems too. You want them even. HOW DO YOU ASSESS TIGHT HAMSTRINGS? This is easily measured by a physical therapist or trainer, and can be done in a variety of ways. My favorite testing method is done while you lie on your back. The hip is bent to the 90 degree position and then the knee is straigthened from there and the angle at the knee is measured. To do a quick test to see if you may have tight hamstrings withoutthe help of a professional. Sit on the floor with your legs straightened out in front of you. Can you sit with your knees straight while keeping your back in a neutral posture ( meaning good sitting posture with your spine straight)? You should be at a 90 degree angle. Here is the program that we are doing in the hamstring challenge. Give it a try for the next 8-weeks. If you can get measured at the start and then again at the end it would be a great idea and rewarding to see your progress. 3. Foam Roller: Massage hamstrings by sitting on the roller and rolling up and down them length of the hamstring from gluteals to the knee. Let me know how you did in the feedback ! You CAN rid yourself of tight hamstrings and feel yourself moving more freely and maybe even notice pain syndromes disappearing ! PREVENTING BACK PAIN AT HOLIDAY TIME ! 1. 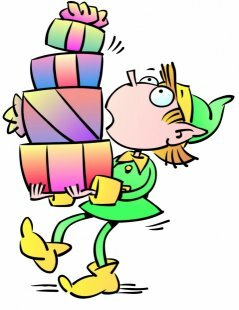 Lift with your legs, when hoisting up packages and boxes of Christmas decorations.Try specifically not to bend, twist and lift all at the same time. Exhale when lifting. This helps to decrease disc pressure that could lead to a herniated disc and also helps to engage your core, which will help keep your back stabilized. 2. When carrying boxes and packages, keep them close to your torso. Don’t try to carry too much. The lazy mans load does not apply here. If you are shopping, unload some of your gifts into your car during your shopping visit so you are not trying to carry too much and then engaging in awkward postures- as you lug around 15 shopping bags, carry a purse, text and drink a latte. 3. When picking up grandkids, etc, lift with your legs. Do not swing kids around or even sit for prolonged periods of time on the floor playing with new toys. These positions can strain the back. Also trying to shop, cook and decorate holding a child on your hip can be very tiring for the back and the arm. You are unbalanced when lugging a kid around. Put them down and give them a job to do instead. 4. When handling boxes of Christmas goods that are on the floor or on low shelves, kneel or squat, rather than bend and hunch over. This position increase disc pressure and makes you at risk for a herniated disc. 5. When wrapping Christmas gifts, don’t do it hunched over or on the floor . Put the gift up on a countertop or table so that it is at waist level and you can maintain correct posture while having the gifts at this comfortable height. Standing or sitting on a high stool is best since sitting on the floor usually causes you to strain the upper body and low back. 6. Don’t force yourself into contorted positions while reaching or use a prolonged awkward position to decorate Christmas trees or hang Christmas lights. Find someone taller, or use a stable stepping stool. Straining to reach as you flex forward can really strain your back muscles, put increased pressure on your discs and increase your risk for falls. 7. If you must use a ladder, make sure it’s stable and have someone hold it at all times. The most common fracture that occurs when falling off the ladder is heel bone (calcaneal) fractures. Trust me on this one, I have personal experience. Not an easy injury to heal from. 8. When carrying packages outside, first scan the path you’ll be walking to make sure there’s no ice or anything else you might slip on. If you can’t see over your packages or out in front of you, make two trips. 9. If driving for long periods, stop every 2 hours for some stretches, walking and water. While sitting for extended periods in your car, be conscious of good sitting posture; no persistent slouching or leaning. Use a lumbar support pillow to help keep your lumbar curve in a healthy position. Feet on the dashboard is not a good position for your body. Perform some of your Pilates exercises like chin tucks, shoulder shrugs and rolls, seated pelvic tucks, gluteal squeezes, and spine stretches forward. This will help to keep your postural muscles happy. 10. If traveling by air, get up every 30 minutes and walk around and continue to use your lumbar pillow. Perform the exercises above as well to keep the back from getting stiff. Add in some toe tapping and ankle pumps to keep the blood flowing in your legs too. 12. If you will be standing in your kitchen for a long time baking and cooking, try to either stand on a shock reducing mat or wear supportive shoes to help alleviate strain to the back while standing. The support of the shoes will help you to stand taller and decrease strain on the legs. Ho, ho, hold in your core to help keep postural muscles in check. 13. Do not skip your workouts. Make time to take care of your body with a PILATES CLASS, a roller workout, gym visit , or walk. You will feel so much better if you just take 30 minutes a day and move your body. I know what all of you are going to do today !!! Same as me- rake up the messy yard !! So here are some tips using your Pilates Principles to stay back pain free ! Warm up – Take a 5-10 minute brisk walk to warm up your muscles. There is no scientific evidence that stretching before an activity prevents injury BUT Lay on your roller and loosen up your fascia/connective tissue. Choose the Right Rake – Use a rake that is proportionate to your body size. Using a rake that is too long or too short will cause you to alter your posture and strain your muscles. Consider the rake width. Narrow rakes may make the weight of the leaves lighter but they can also make the job longer. Extra wide rakes gather more leaves but can put more of a strain on your back. Watch Your Posture – Like any exercise, proper form is important. Muscle pain and strain occurs when you put your body in awkward positions and then try to contract or extend muscles in these odd positions. To maintain proper posture while raking keep your legs slightly bent, your weight centered, and reach with your arms and not your back. ENGAGE your CORE while pulling the leaves toward you. Meaning, exhale as you pull or push anything. Make this an ab workout. After every 20 minutes of raking activity stand up, place hands on hips and gently stretch into a back bend ( like swan dive or swimming) for a few seconds 3-5 times especially before lifting anything. Switch Hands Frequently – You exhaust your muscles with repetitive motion. Switch your lead arm frequently while raking to prevent, or alleviate, muscle exhaustion. ALSO switch jobs occasionally. If you are raking with a partner. You rake for a while, while they do the pick up and then switch. Take walking breaks to break up the raking repetitive motion. This will give those muscle patterns a chance to relax. Bend With Your Knees – When lifting leaves keep your back straight and bend with your knees and hips, not your back, when reaching down. The power for your lift comes from your buttocks and legs and abs. Exhale as you lift to decrease disc pressure. Make the piles small to decrease the weight. Rake With the Wind – Let Mother Nature give you a hand if possible. 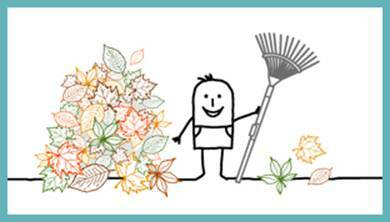 Rake leaves with the wind, even if the spot in the yard is different from where you wanted to rake the leaves. Rake them on to a tarp and drag the tarp to your desired destination. Use a Tarp – Leaves are lightweight and can easily be moved on a tarp. Rake the leaves onto the tarp and pull one end of the tarp to move the leaves to your desired location. Doing this can save your back constant bending over to pick up piles of leaves to put into a garbage bag or wheelbarrow. Drink Plenty of Water – Muscles need water to function optimally. When you maintain your body’s water levels during use, you allow your muscles to coordinate with each other properly and support your physical activity. Wear Good Shoes – Wear supportive shoes with good arch support and skid-resistant soles. Standing on your feet and raking all day can put a lot of strain on your feet and legs. Good foot and arch support can stop some of that strain from reaching your back and skid-resistant soles can minimize the risk of slipping on wet leaves and falling. Consider a Leaf Blower ( or handsome lawn boy) – There are some lightweight gas and electric leaf blowers on the market that are hand held or can be worn like a backpack. Blowing all the leaves into one large pile or onto a tarp can save time and lots of energy. Wear Gloves – Give your hands a break and wear gloves to prevent painful blisters. Take Frequent Breaks – Taking your time will make it less likely for injuries to occur. Pushing yourself to the point of exhaustion can cause you to get sloppy with good posture and lifting techniques, setting you up for injury. 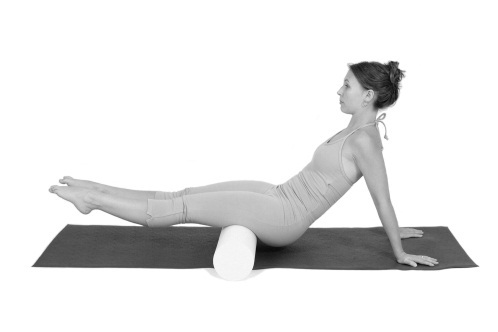 AT THE END: Lay on your foam roller afterwards to encourage your spine to come back into its normal neutral posture !!! Lay there for at least 10-15 minutes. Propping pillows behind your back and under knees when resting to take pressure off of your lower back. And when all else fails, see me for a private session to assess your problems, or come to class to work out the kinks. Movement heals ! The Proof is in the Pilates ! Today was a self-affirming day for me. I had a NEW person that had just used the foam roller for the first time the day before tell me that it was the first time in 3 months that she woke up with out leg pain. As a physical therapist I live for comments like that. I am passionate about helping people feel better and I know beyond a shadow of a doubt that if they are dedicated and actually do the exercises regularly they will work. I studied it, trained in it, practiced it, tested in it and licensed to practice it. When I was in the clinic I saw wonderful successes with all types of injuries. But did not regularly get to see the long-term effects of a guided exercise routine, done with precision and professional guidance. By long-term I mean years. If any of you have ever had PT you know that you are severely limited in how long you can attend PT. Some times it’s for 6 months, sometimes less. Many times I had to discharge patients before I knew they were strong enough or ready to be exercising without a professional by their side. Sometimes even after as few as 6 visits. Part of the reason that I now practice mainly in the private setting is because I did not feel the patient or myself had enough time to accomplish the goals we set. Insurances and productivity were my boss. Not the outcomes. What is wonderfully rewarding to me now, is to see a group of clients that have been with me for a few years, prove all the theories, research, and Joseph Pilates himself correct. I see clients that have overcome back pain from severe accidents, postural deformities, joint replacements, and surgeries. I have seen their bodies change. 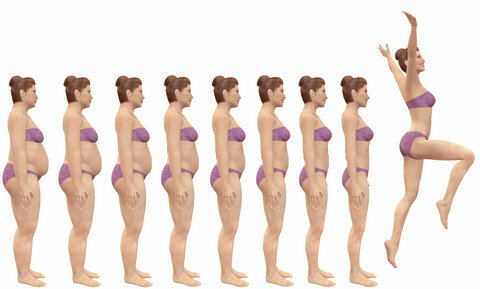 Not only physically with muscular definition and weight loss, but seen changes in flow and ease of movement. I have seen pain syndromes vanish or lesson . I have seen attitudes towards pain and dysfunction evolve to healthy thought. I have seen clients learn that it is not about beating yourself to a pulp to achieve exercise results but about focused, controlled, educated movement that gets results. It’s about knowing WHY you are doing a move and WHAT is happening in the body and HOW your body and mind respond to it. Successful clients that come to my classes and private sessions have an open mind, they notice that there are improvements that can be made, without taking offense.They let their egos go. They listen and learn about the anatomical descriptions and physiology behind the problems with our bodies. When you understand the processes you can make change happen. We joked today about having a bunch of you show up to a class where people are not performing their best, and scattering you throughout the class so you can inspire people as to how exercise proficiency is achieved. We will do a Pilates FLASH MOB !! Who’s in? To me this is like doing a long-term research project and seeing my hypothesis proved correct. THE PROOF IS IN THE PILATES. Do it, live it, see it, feel it, work at it and voila’– magic happens. It is what keeps me passionate, it is what keeps me creative, and it is why I got into this field to begin with. Your body is a gift to cherish. Your success is my reward. Thank you to all of you who make what I do a joy and for allowing me to do what I love. I honor your dedication, you inspire me.